(1Sep05) This issue will detail some structure in Bobsboat. 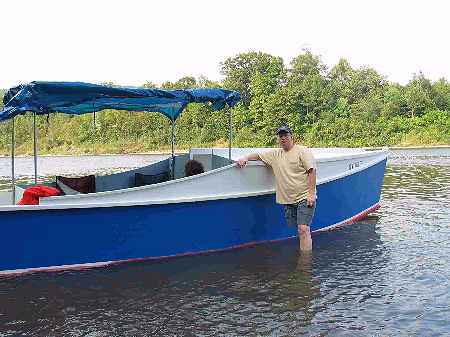 The 15 September issue will take a look at the Russelville, Arkansas messabout. Going for a ride in Brian Walker's prototype Veep14. Funny thing about decks is that they can be quite heavy. 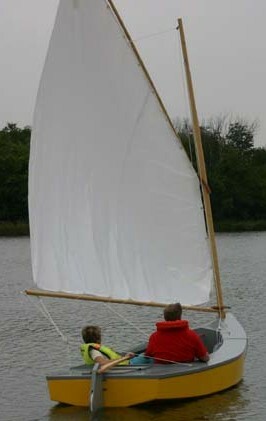 Two of my first boats, the Bolger Jinni and Birdwatcher, had decks from 1/4" plywood. I suppose the largest unsupported areas were about 18" square. I am not heavy compard to a lot of you, about 170 pounds. When I step on those decks they creak but I don't think they ever cracked. Bolger was big into 1/4" ply back then and he is not a heavy man. Most folks would not be happy about walking on a deck of 1/4" plywood even if it doesn't crack. So a deck that will really get walked on should be 3/8" thick minium. But a deck that usually won't get walked on can be 1/4" I think and that might include decks for canoes and rowing boats and smaller sailboats where you can't step away from the cockpit anyway. 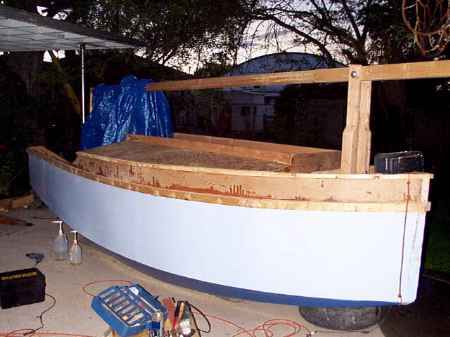 Bobsboat is pretty large and at times folks will step on its decks just to get on and off the boat from a beach so I would use 3/8" ply on its decks. One my boats you won't have separate bilge panels unless it is a taped seam multichine. Flexing does not seem to be a problem because these panels are seldom very wide. But some judgement is in order with these because they can take a beating at times. Even on the little canoes I would use at least 1/4" here - you might try 1/8" to save a bit of weight but there is a possiblity of getting a rock through it in certain conditions. 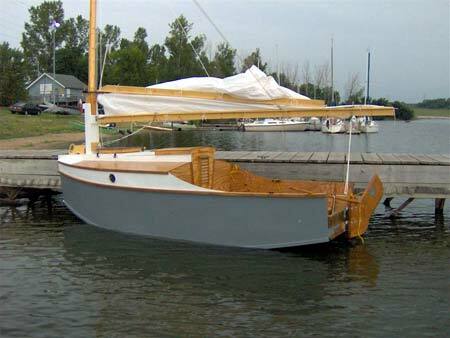 So as a general guide I would use 1/4" ply for bilge panels for boats under say 14' long, maybe 3/8" ply from there to say 20' long, and maybe 1/2" ply for boats even larger. For Bobsboat I will specify 3/8" ply. Power boats have a much more difficult bottom situation because performance is for the most part just a result of high power/weight ratio. Remember the old rule that it takes a horse to plane 50 pounds of weight. A sheet of 1/2" plywood weighs about 50 pounds. So you can't just pile it on like you can with a sail boat that will be trailered (any cartopped boat has to be light to be successful). My AF4 supplied me with guidance on this subject but not because I wanted it to. The original drawings had a 3/8" bottom with three longitudinal stiffener/skids on the outside. When I built my prototype I bought some 3/8" ply but like most plywood nowadays it was undersized and is really 5/16". It has been nothing but trouble both from the standpoint of flexing and leaking (through knots and such) but has never failed. As with the old Jinni it can be frightening to watch in rough water and guaranteed to make you slow down. When Max built his AF4 he knew of my troubles and made his with a 5/8" bottom and a single 2x4 stiffener down the bottom center. His is like iron although his boat is about 150 pounds total heavier, not all of it in the bottom. So another 3 hp needed but maybe it was worth it. The current AF4 drawings show a 1/2" bottom. 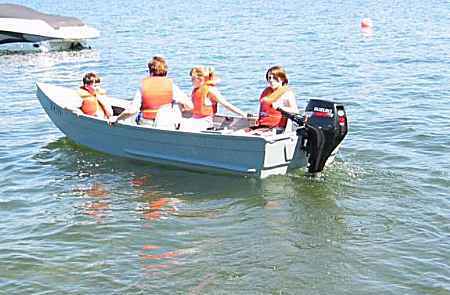 ...We'll go for some boat rides at the messabout in Russelville, Arkansas. Af4 Grande is a 20% scaleup of the original AF4. Scaling a design can be interesting. If the design is scaled up by a factor of1.2 as it was here then the areas of all the panels are increased by a factor of 1.2 squared (1.2 times 1.2) which is 1.44. 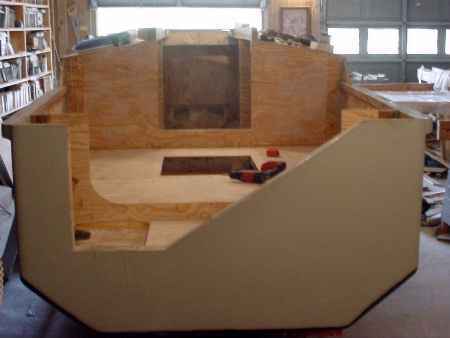 With a plywood boat, if you keep the panel thicknesses the same as the original, you would expect the hull weight to also increase by that amount. In thecase of AF4G that is about what I did. I used the same skin thicknesses that Max Wawrzyniak used on his AF4, 5/8" bottom and 3/8" elsewhere. He said the weight of the bare hull was about 425 pounds. So I would expect the 20% scaleup to weigh about 1.44 x 425 = 612 pounds. 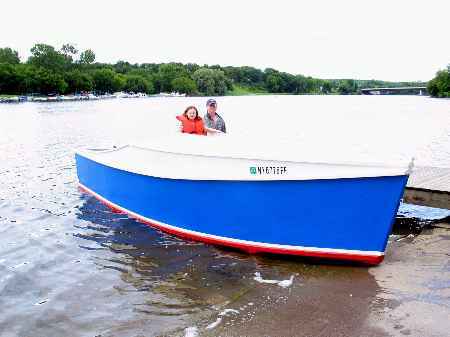 In this caseit isn't quite so simple and I'm guessing the bare AF4G hull would weigh about 700 pounds since the larger boat has built in seats and another bulkhead and some thicker framing. By the way, I would expect the cost of the project both in labor and materials to increase in the same proportion as weight. Eric Shadow built the prototype in New York and I think it is into its second season. It is a large and straight forward job. You can see in this photo how little water the boat needs even though it is over 20' long - maybe 4" will float it. This long and lean project is a 19' version of Toon2. 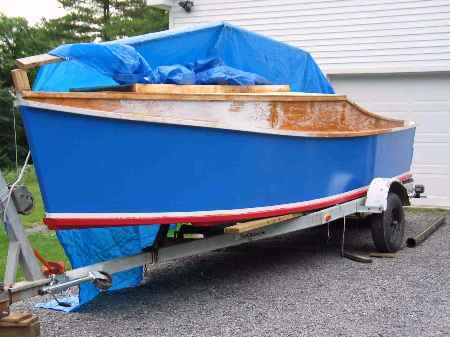 Next issue I will have a photo of the painted hull awaiting its sailrig.